Revenge has driven Wolf Richards since the brutal murders of his wife and young daughter. Returning home with his son, Cal, he faces memories and loss at every turn. Raising Cal alone seems to be more of a challenge than he can handle. He can never replace his perfect Emily—until a rough-edged female falls into his arms—and living becomes a new adventure. Lizzie Sutter is as rough as a cowboy and as compelling as a stormy sky. 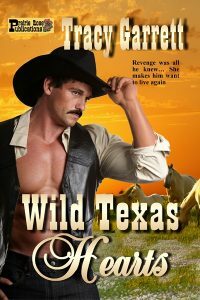 Dressing as a man allows her to hire on with a cattle drive, only to be discovered and set adrift near Civil, Texas. When she stumbles onto an abandoned cabin, she makes herself at home. Then the owner of her newfound home shows up and Lizzie discovers just what’s missing from her life—and her heart.